Here’s a post to help you feel whole this Valentine’s Day, in all of your complex and beautiful glory.The number one topic I’m asked about in psychic readings is love. This is no surprise, as it’s the area I’m learning to master, and have struggled with the most. See my post on the Girdle of Venus in palmistry. My message today is: if I can find love, so you can you. As a 29/11/2 lifepath, or Spiritual Messenger in numerology, my purpose is to create healthy relationships. So, I have a history of doing the complete opposite. It taken me 16 years and dozens of tries, to find my Soulmate. See Six Myths About Soulmates, Busted. So, I’ve been there and done that. I know what it’s like to come back from total heartbreak, and still believe in love. As someone who is (finally) getting married at age 36, it’s time to honour my past. Find your lifepath. To be a professional psychic isn’t easy. Until you learn how to clear your mind, body and soul, you feel burdened knowing so much about your clients. However, there’s also a deep satisfaction in helping people ‘come clean’, which is why I’m still in the industry after ten long years. Listening to stories of recovery keeps me in a place of gratitude, and reminds me never to give up. Thought I still struggle to ‘air my dirty laundry’, it’s clear this is my calling. I specialise in helping people connect with their goodness, while releasing their shame. After all, nothing is dirty, but thinking makes it so*. We are all innocent in God’s eyes. Coincidentally, my grandmother ran a laundromat – so, like me, she fed her family by dealing with people’s stuff. She was also psychic. I’ve met many intuitive healers who are part-time cleaners or environmentalists. Perhaps it’s because we’re not afraid of hard work, and love a clean world. Kris’s grandparents also ran a laundry – no wonder we are so well matched. There’s something in me that won’t settle for second-best, and that’s the reason I finally found my Soulmate. Like me, Kris is a psychic reader in Brisbane (see his Tarot and Reiki website). He’s musical, hilarious, loving and most of all – wants to lift humanity, more than he needs to stay safe or accepted. Perhaps that’s why our son Forrest is such a character. Since he was born, I’ve told him, “you’re an infinite Soul. You come from love, you’re here for love, you are love. There’s nothing to be afraid of. Life is just a game and you’re protected at all times”. Forrest is an 18/9 Old Soul lifepath. 18/9 is the vibration of the word LOVE in numerology. No wonder he attracts so many people. His heart is full of life’s music. 1) Measure your life by what you’ve gained, not what you’ve lost. True love is inner growth. If you’re a better person for dating someone (or vice versa), it was worth it.The one gift we keep is wisdom. I’m okay with the challenges I’ve faced because I know they will pay off over several lives to come. Even if you don’t believe in reincarnation, understand that, every time you conquer the fear of growing, you’ve taught those around you that love is the answer. Tip: Write a list of your ex-partner’s names, and next to each, write 1-2 things they taught you that you will never forget. These could be positive or negative lessons. It doesn’t matter, it’s moved you forwards. Read this out loud. Then visualise your exes in a bubble, and blow the bubble into a golden sunset. Imagine the bubble contains all the pain and baggage that you no longer need. See it disappear in a flash of light and breathe deeply until you feel at peace. If you like, you can say out loud, ‘thank you Spirit, for giving me these lessons, so I can integrate them and move on’. More on forgiving your exes. 2) When in doubt, talk it out. The heart is your emotional home. Unfinished business is like a sofa wedged in the front door. It prevents love from returning. Happiness is your greatest asset. Without your love of life, you’ll never have a love life. If it takes months of acupuncture, kinesiology, crystal healings or Reiki to balance your body, so be it. If it takes years of regular counselling, life coaching or readings to clear your mind, so be it. If it takes decades of personal growth, travel or even going back to Uni at 40 to find your passion, so be it. It takes what it takes. More on releasing your exes. When cutting down a tree, you don’t stop at fifty axe strokes – you keep chopping until the job is done. Healing is the same.Just as a business never outgrows its owner’s mindset, your happiness can’t outgrow your mental health. If you still think about your exes, please get help. You might think you’re keeping your feelings to yourself but I promise you, they’re leaking out. Everyone knows when your attention is somewhere else. For all our sakes, ‘clean up your laundry’. It’s never too late to heal. I’ve read for 90 year olds who were still planning marriage! Tip: 2017 is a Universal 1 Year of beginnings for the planet. See your 2017 numerology forecast. It’s about forgiving your family and finding independence. If your parents and ex-partners didn’t teach you how to love yourself, it’s time to ‘be your own cheerleader’. Set aside an hour a week to get a healing, or to follow up a childhood dream e.g. play music, sit on a swing, ride a bike (similar to Julia Cameron’s idea of Artist’s Dates, which ‘refill your consciousness’). You invest 40 hours a week growing your boss’s business, why not an hour a week nurturing ‘the golden goose’? The payoffs will be instant – a sense of control, and feeling of freedom. A little self-love, goes a long way. Each year, I spend hundreds of hours on meditations or healings and it pays off in every area of my life. Positive people attract love, grace and abundance in a way stingy people don’t. See my latest Angel Meditation MP3. 3) Love yourself and follow your purpose, even when it seems impossible. Base your relationships on transparency. That’s how you create a truly happy ending.When you live from the head, you’ll always want to make other people, or yourself, wrong. The ego thrives on fear and control. It loves to tell stories that your relationship broke up because you were too fat, or ugly, or stupid, or poor. The truth is – a relationship only ends when your Soul feels you are ready to move on. You’re never being punished, just promoted, even if you can’t see that right now. Tip: If there’s one thing I’ve learned, it’s to sing your own song. We all have many potential Soulmates, who have agreed to be with us, sometimes lifetimes in advance. Make it easy for them to find you by showing your true colours. If you’re a red bird who wears blue make-up (for example, an introvert pretending to be an extrovert), no wonder your true love can’t find you. 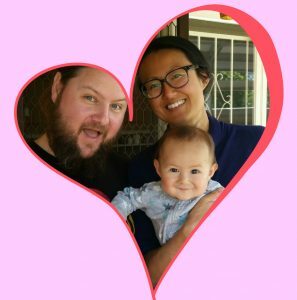 I met my Soulmate after writing a romance wishlist, just after quitting my 9-5 to focus on my psychic business. At the time, Kris had just landed his first TV Show (see our first meeting – fast forward to 3 minutes, 41 seconds) two weeks prior. I needed a guinea pig to demonstrate relationship palmistry on – he volunteered – and the rest is history! I’ve read for many clients, who were single and unhappy in their jobs, before becoming Mr. or Ms. Popular when they switched to what they love. As hard as it can be, committing to your dreams, and keeping promises to yourself, is the fastest way to meet someone on the same wavelength. Why would the Universe reward you for playing small? Eagles meet in the sky, not crawling on the ground. And be honest. If you were buying a house, you’d want to know its history and any issues, right? Show your partner the same respect – be upfront about your needs, wounds and dreams and you’re more likely to start off on a good footing. Communication is the blood of a relationship. If you can get it flowing early on, you’ll have the energy to stay together as long as needed. Of course, that’s easier said than done. Many of us learn emotional literacy through trial and error, while others like myself studied it through Holistic counselling. Knowing how to describe your feelings, how to stay present during a crisis, and how to listen to your partner without interrupting are vital skills for building a healthy relationship. Read more on the Five Love Languages and Words of Affirmation. This Valentine’s Day, it’s time to celebrate your journey, no matter what potholes you’ve fallen into in the past. It doesn’t take a partner to make you feel happy – it takes you to allow happiness in. Whether you’re dating a person, or dating yourself, give it all you’ve got. As Osho wrote, It’s time for us to rise in love. As a bonus: here is a track I recommend to clients who tend to doubt themselves. It’s a mantra by Deva Premal and Miten, called Aham Prema. This is a profoundly healing song to sing to yourself, with your hands on your heart. Repeating ‘I Am Divine Love’ 108 times to yourself, is a gift you’ll never forget. Buy Password.